After Paul's first evangelistic journey completes he, and his fellow laborer in the gospel Barnabas, stay in Antioch for almost three years (Acts 14:26 - 28). Paul, Barnabas and several others (Acts 15:2, Galatians 2:1 - 2) travel to Jerusalem to meet with other church leaders regarding the dispute over circumcision and its role in salvation. This unique meeting of the church is known as the Jerusalem conference. The two evangelists have a meeting with a few of the apostles concerning the issue. All those in the meeting agree circumcision is not required for salvation. Barnabas and apostle Paul then inform the gathering of all the fruits that were generated after his first missionary journey and his success among the Gentiles (Acts 15:12). List of 120+ people connected to Paul! What were Paul's many identities? The final view regarding the issues discussed at the Jerusalem conference is given by James. The believers gathered agree that circumcision is not necessary for salvation. The conference decides to have some men go with the apostles Paul and Barnabas to help them inform believers in Antioch regarding the decisions reached (Acts 15:30 - 32). In Antioch Paul and Barnabas have a heated discussion over the inclusion of John Mark in their missionary journey. Barnabas, the uncle of Mark (Colossians 4:10), wants to take him on the trip while Paul does not. Their disagreement is so sharp that they separate (Acts 15:36 - 41). Paul begins his second evangelistic journey by taking Silas with him to Tarsus. They go to the cities of Derbe and Lystra where Paul meets Timothy for the first time (1Timothy 1:2, 4:14). While journeying northwest of Pisidian Antioch Paul decides to preach in the western part of Asia. The holy spirit, however, does not allow him to travel in that direction (Acts 16:6). He eventually ends up in Troas. God gives Paul, while he is staying Troas deciding what to do next, a vision conveying what he wants him to do next (Acts 16:8 - 9)! The group soon leaves the city for Neapolis then Philippi (verses10 - 15). Paul, in Philippi, casts a demon out of a slave. The slave's owners, who were making money off of her demonic powers, have the apostle and Silas thrown in prison. They are only set free when a miraculous earthquake occurs and loosens their bonds (Acts 16:16 - 24). After Philippi the evangelistic team travel to Thessalonica. Although many in the city believe and accept the gospel, a riot forms that causes Paul and company to flee to Berea (Acts 17:1 - 8). The Bereans not only listen to what is preached but also verify it against the Bible (Acts 17:11 - 12). Apostle Paul is forced to leave Berea for Athens after unbelieving Jews visit the city and start to cause trouble for him (Acts 17:13 - 15). In Athens, he is given a chance to explain the basics of the gospel on the city's well-known Areopagus (verses 16 - 19). Paul leaves Athens for Corinth, where he meets Silas and Timothy (Acts 18:1 - 5). The apostle preaches in the local synagogue until it eventually splits. He stays in the city for around 18 months. Paul, in late 51, is brought before Gallio (Acts 18:12 - 18) but is soon released. In early 52 he goes to Cenchrea where he takes a vow and has his head shaved. He, Priscilla and Aquila then travel to Ephesus by ship. In a short time he leaves them in order, if possible, to be in Jerusalem for the Feast (Acts 18:18 - 21). During the Spring Holy Day season Peter visits the city of Antioch. He does not mind eating or talking with uncircumcised Gentile converts until brethren from Jerusalem, who still believe in circumcision, arrive. When they come Peter and others stop eating with the Gentile converts. Paul publicly corrects Peter for his unbiblical behavior (Galatians 2:11 - 20). Apostle Paul begins his third missionary journey by revisiting Galatian churches. He then goes to the Phrygia province in order to strengthen believers (Acts 18:23). Paul travels to Ephesus and live there for a little more than 3 years (Acts 19:1 - 20). In late 57 A.D., an idol-making silversmith decides something must be done about the Apostle Paul. His income and those of others like him have dropped due to the gospel taught by the apostle. He organizes a meeting of tradesmen concerning the issue of lost idol business. A riot soon breaks out that seeks to find Paul. Though the mob is eventually quelled by a city clerk, he leaves the city for Macedonia. The evangelistic group travels back to Troas (Acts 20:6). Traveling to Assos they set sail for Miletus. From Miletus Paul sends a message asking that the Ephesians elders come see him. When they arrive he warns about false teachings and church splits (Acts 20:26 - 31). He then sails to Patara and then to Tyre (Acts 21:1 - 4). Paul, after spending a week in Tyre, sails to Caesarea (Acts 21:5 - 6). While in the city he stays in his home of Philip the evangelist for a few days. The apostle then leaves for Jerusalem (Acts 21:10 - 15). In the late spring of 58 Paul visits James in Jerusalem. After the visit he goes to the temple with four Jewish converts (Acts 21:18 - 26). His arrival at the temple causes a riot to break out. 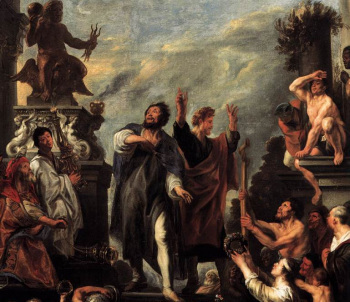 A mob seizes Paul and begins to savagely beat him after he is dragged outside the temple area. The angry mob of Jews, however, disperses when Roman soldiers appear on the scene. The Romans arrest Paul and question him. The apostle escapes being scourged when the authorities discover he is a Roman citizen. Paul is eventually escorted out of Jerusalem under Roman guard. He is taken to Caesarea so that governor Felix can decide what to do with him. Governor Felix holds Paul as a prisoner in Caesarea for more than two years. Felix does this because he hopes to be bribed into an early release (Acts 24:26 - 27). When Porcius Festus replaces Felix as governor in 60 A.D. the case against the apostle is repeated. Paul, refusing the offer to have his trial in Jerusalem, requests his case be heard by Caesar. Festus agrees and soon sends him off to Rome. Paul, along with several other prisoners, boards a boat bound for Rome. This is considered the start of his fourth of five missionary journeys. The ship runs into bad weather as it sails to reach the port of Phoenix on the western side of Crete. It is soon driven off course and out to sea. Unable to be controlled, the ship wanders the Mediterranean for roughly two weeks. It is abandoned by its 276 passengers when it runs aground off the island of Malta (Acts 27:37 - 44). After a short stay on Malta Paul and the other shipwrecked passengers set sail again and land at the Italian port of Puteoli. He then travels to Rome using the well-known road called the Appian Way (Acts 28:12 - 16). While in the city of Rome the apostle Paul is allowed to live by himself with only one soldier to guard him. He is allowed a great deal of freedom and continues preaching the Gospel. Paul's charges, presented in from of the Roman authorities, are dropped and he is set free. After his acquittal Paul begins his final missionary journey by sailing to Crete (Titus 1:5). From Create he travels to Nicopolis (Titus 3:12) then likely leaves to fulfill his goal of preaching the gospel in Spain (Romans 15:22 - 28), possibly Great Britain, and other areas. Paul is again a prisoner in Rome. The Bible is silent regarding the circumstances and location of his arrest. From his Roman cell he writes to his closest friend Timothy (the book of 2Timothy). Paul's death, at the hands of the Romans, occurs around May or June in 68 A.D.
How long was the apostle in prison? Paul mocks the foolish wisdom in Corinth! Was Saul the greatest sinner?